Nokia’s Asha lineup has been a big success in developing markets and the Nokia Asha 310 just aims to build on the solid foundation that has been laid out. An ultra-affordable feature phone with a dual-SIM and Wi-Fi connectivity support, it is a compact little device. Our initial impressions are of a cheapo light and plastic device, something that you can use as a backup phone and take with you to the beach without fearing you’d lose or damage it. For people in developing markets, the Wi-Fi connectivity is a nice addition. The Asha 310 comes with a 3-inch capacitive WQVGA display and runs on Nokia’s Series 40. Nokia is bundling this with free games from EA, but those are very basic Java titles, nothing like the graphically awesome titles from Android and iOS. 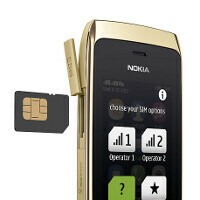 The Nokia Asha 310 supports microSD cards of up to 32GB, and 2G cellular data.The device is coming to Asia, India, the Middle East, Africa and Brazil in Q1 2013. I dont get it, what is the difference between this phone and a smartphone? Its low end, but it can do all the basic things a normal smartphone can, or im i missing something? For me it kinda feels like its just the big dogs bullying the small brands (meaning asha, not nokia), to have one less competitor. At this point, it is not a matter of function. It is true that this phone will do many things that, say, an S60 Symbian smartphone could do in 2005; however, S40 is still nothing more than just a UI running on top of nothing but Java... thus, it has everything in common with a feature or basic phone over the last decade or more, as far as the actual OS goes. It is powerful for a feature phone, almost as powerful or equally as powerful as BREW MP, depending on your viewpoint, but it can never be a 'smartphone' by definition. ... sort of in the same way that HSPA+ is not really '4G', even though some people call it that... it isn't bad at all, but please... let's at least be honest. This idea that everything must find a way to be called a 'smartphone' just in order to sell at all is ridiculous! thanks i did not know that. But i dont entierly agree with with your views on the brand of smartphone, even though there are other things people value when buying their phones. Brands like smartphone, 3g or 4g are taken for granted, and so when people say they dont have that or it isnt that, even when it works in the same way, the product looses a lot of value for the average consumer. An exelent example right now is the new HTC camera with 4 mp, that will take a lot of convincing, even if the techguys says its as good or even better than other cameraphones. For a techguy working with the device its world apart from the real thing i guess, but for a regular consumer whos just using it, its a smartphone. "Cheapo light and plastic feel" pretty much sums up all Samsung devices, though.